Tensions among people from different religious communities – stemming from differing beliefs, from distinct perspectives, and from misunderstandings – have contributed to increased levels of political violence and terrorism around the world. Yet, there is a remote corner of Uganda where Muslims, Jews and Christians live together peacefully. This unique story, a vision of productive cooperation that bridges religious differences, needs to be shared. unprecedented cooperative business venture in which more than 700 Muslim, Jewish and Christian farmers have joined together to market and export their coffee. 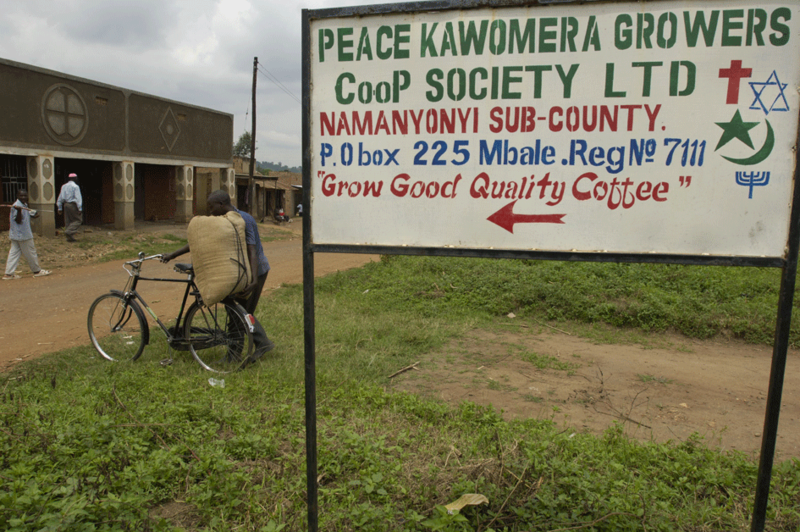 The label of Mirembe Kawomera (Delicious Peace) coffee features a graphic with a crescent moon, Star of David and Christian cross. The cooperative’s founder, J.J. Keki, is the only Jew to have been elected to political office in East Africa. He explains how these diverse religious groups came together in study and discussion to focus on the common values that unite them, not the differences that caused division. These lessons need to be explored and presented, not only to inspire our children and youth, but also to provide models for mutually beneficial religious, social and economic dialogue and cooperation. Photojournalist Richard Sobol and ethnomusicologist Jeffrey A. Summit have been documenting the culture of the Abayudaya for the past nine years and are uniquely positioned to tell this story. Together they produced the book/CD Abayudaya: The Jews of Uganda. Richard Sobol has contributed photographs to such leading publications as National Geographic, Time, Newsweek and the New York Times Magazine. He is the author of eight books for children and young adults. Jeffrey A. Summit is Associate Professor of Music at Tufts University where he also serves as rabbi and Executive Director of Tufts Hillel Foundation. He has recorded and annotated Abayudaya: Music from the Jewish People of Uganda for Smithsonian Folkways Recordings, which was nominated for a Grammy Award. He has recently co-directing a major project funded by the Department of Homeland Security establishing Muslim/Jewish/Christian dialogues and inter-religious education on university campuses. Sobol and Summit returned to Uganda in August 2006 and 2008 to document this spirit of cooperation that is transforming the life of these communities. As a result of their previous work, and involvement supporting educational and infrastructure projects in this area of Uganda, they have developed strong relationships and built trust with these communities. The project “Mirembe means Peace” will bring this extraordinary story to a wider general audience. Through their research, photography and musical recordings, they will create a book for children ages 6 – 12 and a CD blending the voices, compositions and traditional music of these three religious groups. They will also develop a study guide for high school and university students. These educational resources are especially important for use in the growing number of Muslim/Jewish/Christian Dialogue Groups on university campuses in North America and will serve as alternative examples for communities in conflict throughout the world. At a time when few positive stories come out of Africa, and the world is beset with religious conflict, this is an inspirational story of hope, faith and vision.